Last week has been a little frustrating with pivot indications announcing the end of the bull run (since early March). The too obvious 875 resistance level has been almost hit twice and buyers may just give up anytime. This MM Stall level on 867 coincided exactly with a Fib pattern which justifies profit taking. 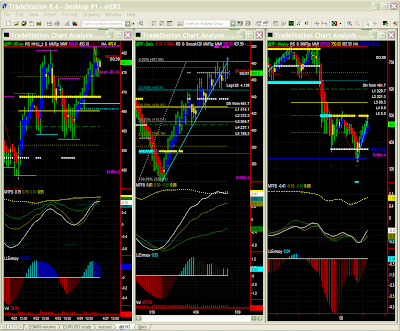 Having said that, the ESM09 tick chart (1597T) shows a 2% FALL, hence we have to be VERY CAUTIOUS here. Check Fib retracement levels (851, 845, 840) for reversal. The 2% early morning morning fall (Mon 27th) is in fact in line with our scenario even if spikes and high frequency moves in general are difficult to capture. We here see a confirmation of our former outlook (last week's reports) for a return to the high 790s. We cannot however discard prices to remain first constrained in a range for a while with a lower boundary in the [820-830] area. While this is way too early, one can already see a target on 766 (2 Fib patterns). 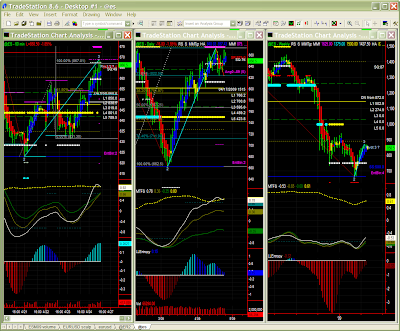 A provisional pivot is now showing, thus giving more credit to our scenario on lower time frames. We've been repeating over and over that the bounce from early March lows would be subject at the very least to some profit taking. We'll now wait for this pivot to be confirmed first to validate our targets (797, then 766). ER (TF) follows the exact same configuration. 468 is a short term test level. Reversal will be confirmedn if it is broken then tested as a resistance level. Profit taking has been long overdue, but again we don't anticipate recent lows (early March) to be tested again.